I draw exclusively with colored pencils, and I get this question a lot. The other question people want to know why on earth, after twenty five years of drawing, have I switched from working on paper? The simple answer is that I find this surface much more challenging, satisfying and fun. And I love the way my work looks on it! It’s a perfect match. While finished pieces on either the Grafix Matte Dura-Lar or Grafix Drafting Film look very similar, the surfaces feel slightly different when drawing on them. 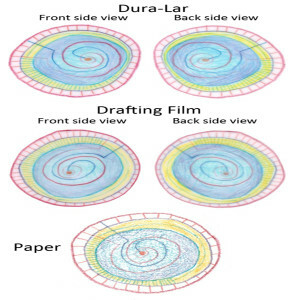 The Dura-Lar is smooth as silk, whereas the Drafting Film has a slight bit of resistance. In comparison, the Dura-Lar seems almost slick, and the Drafting Film a bit dryer. Because of this surface difference the Drafting Film will take a few more layers of pigment. Both allow for a crisp and clean appearance. My son calls the look “high definition”! Precisely right! 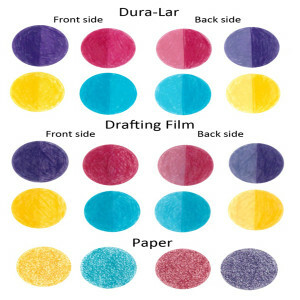 In this comparison between Dura-Lar, Drafting Film and paper, the same wax based Prismacolor Premier colored pencils were applied in the same order using the same pressure. I only used the front side of the film. It is very hard to see the difference in the two Grafix products; it’s really something you have to feel. The magic of both is that there is no paper texture to deal with! This aspect is extremely freeing and saves time. It is hard to estimate how much time is saved, but to me it feels like an enormous amount. The intensity of color is another of the many things I love about working on film. 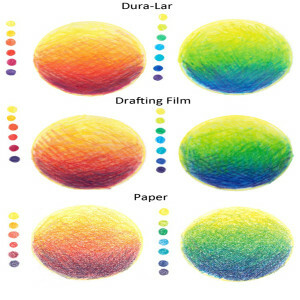 Some people get intense color with colored pencils on paper by using the burnishing technique or applying solvents. My wrist cannot take the pressure required to burnish (which basically obliterates –therefore flattening – the “tooth” or surface of the paper) and I prefer not to use solvents. This surface allows for packing a powerful punch of color with minimal effort. In this example, I employed both sides of the films. First I put pigment on the front side of the Dula-Lar, Drafting Film and paper. I then turned the films over, and colored in half of each circle on the back side. It is interesting that the colors on the Dura-Lar are slightly more intense and a bit lighter. I don’t always use the back side, but it comes in handy in many respects. Sometimes I apply blocks of color similar to a watercolor wash, after which linear details are added on the front. I frequently do most of the drawing on the front, and then use the back side to punch up specific areas that need more oomph. Drawing only on the back can create atmospheric perspective or other interesting effects. The creation of expressive unbroken lines is pure joy and absolutely my favorite aspect of working on these surfaces. I use a super sharp point and barely touch the surface for spider-thin lines, a dull point for wider lines, or the side of the pencil for a wide swath. I have lately turned to creating solid areas purely with line work. Very interesting things happen when lines are applied on both sides of the film. Here is a comparison of lines on the three surfaces. No paper texture to deal with. The pure and intense pencil pigment that is not diluted by any surface tooth. Spectacular unbroken lines ranging from extra fine delicate ones created by barely touching the surface with a super sharp point, to varieties of width made by using a dull point or the side of the pencil. Ease in transferring drawing guide lines due to the transparency. Film is not paper, and doesn’t behave like paper. Allow for some time to get the hang of it. In the same way we all prefer one brand of paper over another, you may find you prefer one film over the other, or enjoy working on both. Find what works for you, and have fun experimenting.